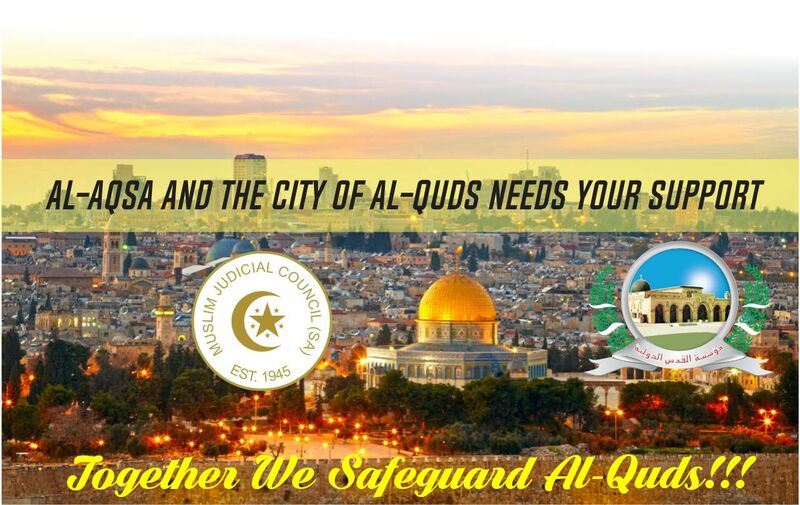 South African Ulama calls you to show your support for Palestinians in the Occupied Westbank as Zionists intensify their onslaught on Masjidul Aqsa Al-Mubarak. What caused the latest violence at Al-Aqsa? Three Palestinians and two Israeli police officers died in a gun battle in occupied Palestine on Friday, 14th July. The Zionist Regime immediately closed down Majidul Aqsa mosque compound for Friday prayers – the first time since 1969. On Sunday, Israeli forces opened the compound under new security measures including metal detectors and additional cameras. Muslims had been praying outside the mosque, Islam’s third holiest site, to protest these new measures that aim to further restrict access to the mosque and curtail their movements. “If not for the leadership of the Palestinian community, the leadership of the Ulama there, the leadership of the Islamic Movement , then those security cameras would have been installed a long time ago,” said Moulana Ihsaan Hendricks, Director of the Al-Quds Foundation and former president of the MJC (SA) to Voice of the Cape radio. The restrictive access for Palestinians and the free movement of extremist Zionist groups to worship at the compound “allows Zionists to seek the legitimacy of Masjidul Aqsa’s compound with the aspiration for the Jewish community to establish the Temple of Solomon on the ruins of Majidul Aqsa,” Moulana Ihsaan Hendricks continued. Fast every Thursday in solidarity with the besieged Palestinians. Imams of Masajid should perform the Qunoot Naazilah during Salaah. Attend the MJC’s and Al-Quds Foundation’s Thursday Siyaam programmes. This Thursday, (27 July 2017) we will be at Darul Islam Masjid, Gonubie Road, Surrey Estate, from Maghrib. All Imams should have a special Iftaar programme after Maghrib Salaah on Thursday and update communities on the latest developments around Masjidul Aqsa. Ensure that our we are educated about the need for Palestine to be liberated and impart this knowledge to future generations.